Arlington County faces an estimated budget gap of $20-35 million for its 2020 fiscal year, which could require cuts to County services, increased taxes and fees, or a combination of the two. County Manager Mark Schwartz provided the news in a briefing to the County Board at its Sept. 25 meeting. He said that County revenues are forecast to grow by a modest 1.5 percent, while expenditures for the County’s current set of programs are anticipated to grow twice as fast. Additional costs that contribute to the shortfall include more funding to support Metro, invest in public facilities, maintain competitive compensation for County workers including commitments to increase public safety pay, stabilize funding for affordable housing, and support Medicaid expansion. The Manager’s budget gap estimates do not include additional funding needs for Arlington Public Schools, which could reach $43 million due to significant enrollment growth and rising expenditures. Schwartz warned that the coming year is likely to be tougher than the last one, when the County Board approved a combination of spending reductions and tax and fee increases, while leaving real estate tax rates unchanged. 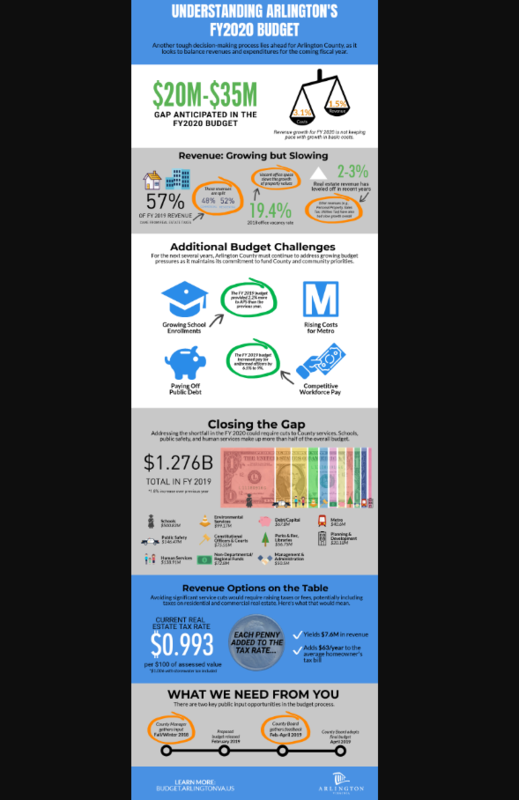 Get a visual look at the FY 2020 budget outlook. “This is going to be the most challenging budget year yet in my tenure with the County,” Schwartz said. “I believe I said the same thing last year, so this year is going to require even more serious and potentially difficult conversations about how to balance our revenues and expenses,” he said. According to Schwartz, all options for balancing the FY 2020 budget are on the table. And the budget challenges facing the County will require an ongoing, multi-year approach. The majority of County revenue comes from taxes on commercial and residential real estate, and these revenues grow when property values rise, or when the County Board approves an increase in the tax rate. The current rate of $0.993 per $100 of assessed value (not including stormwater rates) is one of the lowest in Northern Virginia. Homeowners and businesses in Arlington shoulder roughly equal parts of the property tax burden, unlike in neighboring jurisdictions. This means that when commercial property values rise at slower rates, as they have in recent years due to high office vacancy rates, it often drags down any revenue growth resulting from rising home values. As the County Manager begins developing his FY 2020 Proposed Budget this fall, he will gather input from his leadership team, County employees, the County Board and the public. On Oct. 17, the Manager will host a Virtual Town Hall to provide more information to the public and gather input about budget priorities. In November, the County Board will provide its budget guidance. This year, the Manager will also draw on the County’s latest Community Satisfaction Survey to help identify budget priorities. The comprehensive survey was sent out to a randomly selected sample of Arlington households in August to gauge satisfaction with various aspects of County programs and services. The County Manager will present his proposed budget to the County Board in February 2019. The Board will then hold a series of work sessions and two public hearings before adopting a final budget in April. 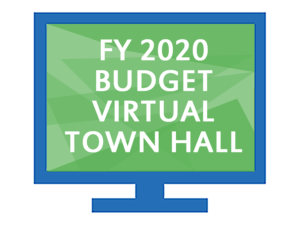 Learn more about the budget, the Oct. 17 Virtual Town Hall and how you can weigh in at budget.arlingtonva.us.